The heaviest M-fettled model yet disguises its weight well - but can 400hp and 560lb ft make it exciting? It's quite possible that the M division engineers responsible for injecting a bit of schportiness into Bavaria's latest model have never before faced such an arduous challenge. 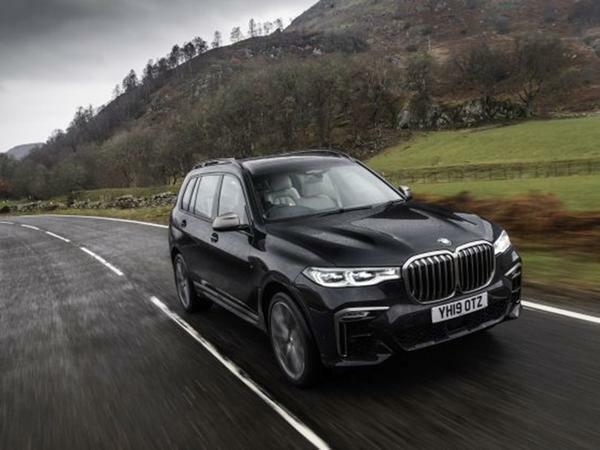 As its name suggests, the branch's new signing, the X7 M50d, is not only a diesel, it's the biggest and heaviest car to wear an M badge on its boot yet. Only a decade ago the prospect of a DERV this enormous being asked to handle, perform and feel like a car from one of the world's most respected performance arms might have seemed silly. 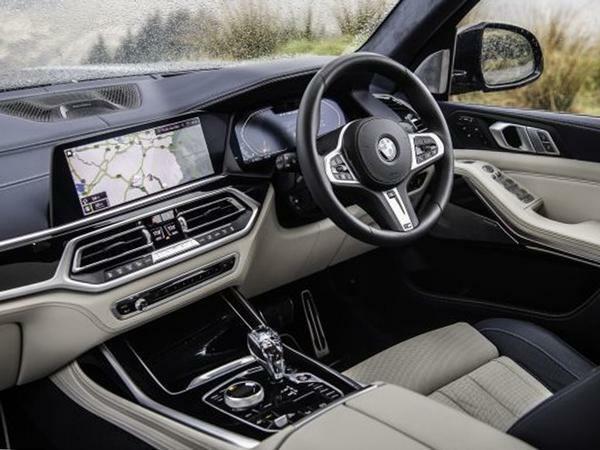 Yet here in 2019, the X7 M50d must do all that while still offering the comfort, practicality and maturity of BMW's range-topping SUV. 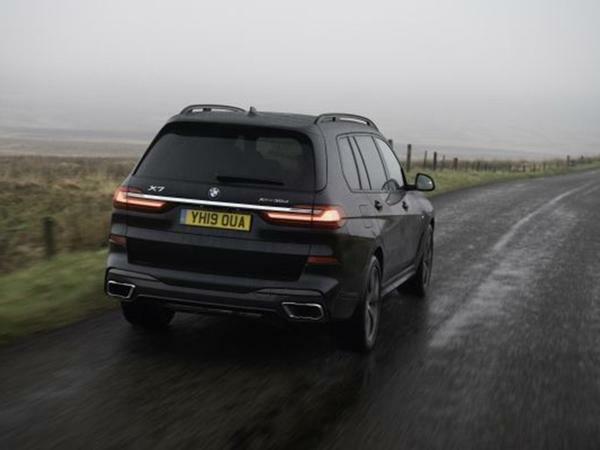 It's presumably for this reason that BMW has been quick to emphasise that the CLAR-based structure the X7 is built upon has more in common with the 7 Series than X5. It uses standard-fit air springs and comes with BMW's multi-mode system to offer everything from Comfort to Sport Plus and, well, it's really, really big, like the saloon of the same ranking. In fact, BMW's X cars have grown so much that the current X3 is bigger than the original X5, leaving the Bavarian daddy of them all to measure 5,151mm in length. That means it extends out of parking spaces 52mm further than a Range Rover, although not even something this vast can wear BMW's most divisive new design detail discreetly. You will, of course, have already noticed the kidney grilles. The X7's gargantuan proportions do, at least, mean the cabin is extremely spacious, with room for three rows of adults to comfortably fit. 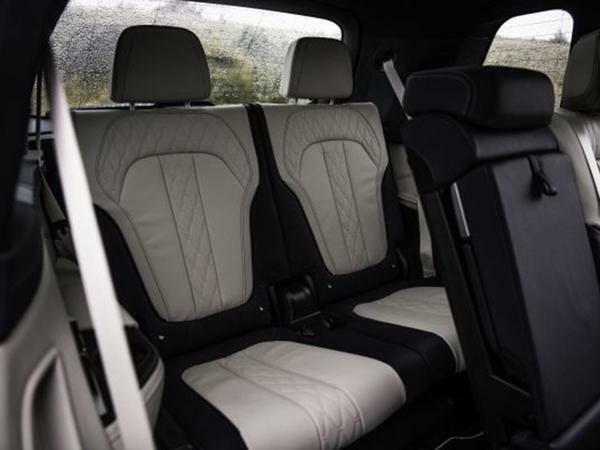 It's a seven-seater as standard, with a £600 six-seat option offering the most luxurious layout thanks to the swapping of a rear bench for two individual chairs, complete with their own soft-cushions and rotating arm rests. But it's not like the regular bench is cramped, with plenty of shoulder and head space for fully grown adults to sit three across. Set the second row to its forward setting via the electronic controls, and the backmost row is provided with enough legroom for a pair of adults, as well. Although this does make the boot - which is normally big enough to swallow 750 litres of luggage - barely deep enough to hold a pair of rucksacks. 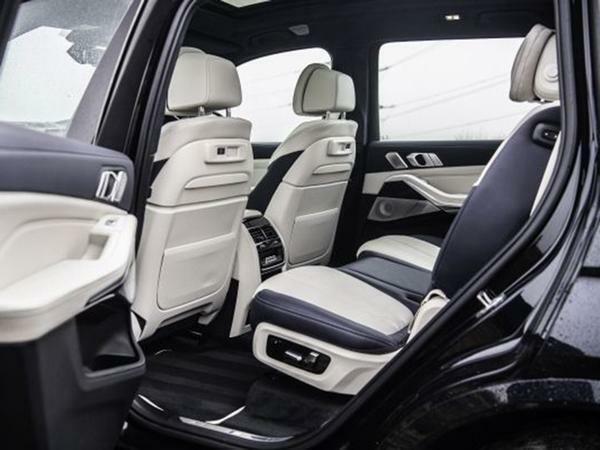 Think of the X7 more as a generous five-seater with space for two in the back when it's needed, then. You can't knock the X7 for its plushness, because it's as luxurious as SUVs come this side of those ones made by Bentley and Rolls-Royce. 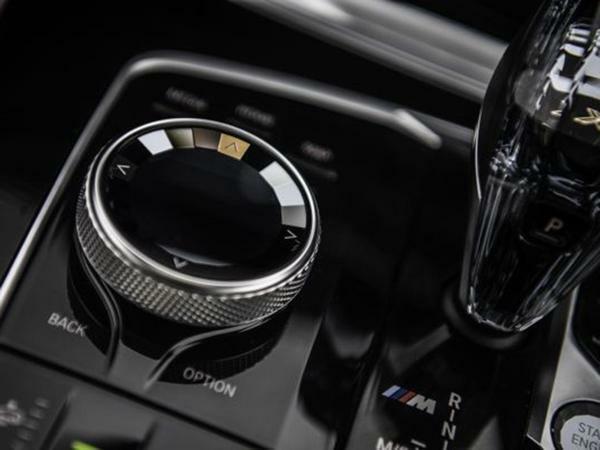 While BMW's seventh-generation digital dash technology still can't match Audi's Virtual Cockpit for theatre, the inclusion of conversational voice control, gesture control and the latest suite of internet-accessed services of which there are too many to list means it's ultra-advanced - although Apple Carplay requires an annual subscription, which seems a bit tight on an £85k car. Start up the M50d's diesel-drinking turbocharged 3.0-litre inline-six and you're greeted by a deep, gravelly tone which is perfectly appropriate for something that burns oil to provide 400hp and 560lb ft of torque. But it's far from shouty - the diesel remains hushed from the cabin in Comfort and Eco modes, only providing something remotely sporty when you click the Sport button on the transmission tunnel. And even this change, we suspect, comes largely thanks to some acoustic assistance from the speakers. 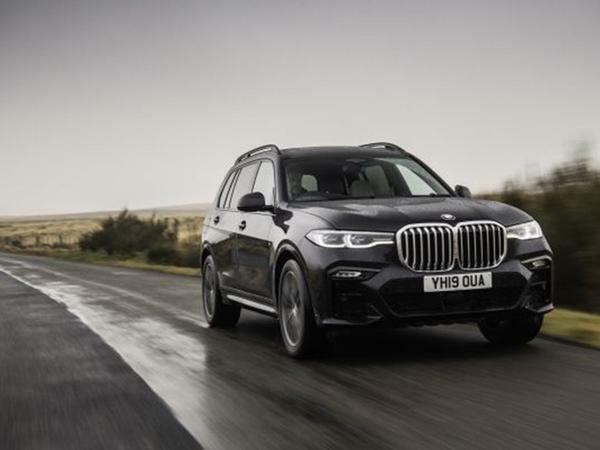 Get going and the engine's peak torque figure arrives from 2,000rpm in a solid slab, shifting the 2.5-tonne M50d forward with real intent, but also none of the back-pounding shove of the smaller X5 that uses the same setup. If you don't venture beyond the normal drive settings, the most muscular X7 doesn't feel particularly bothered about entertaining its driver, although progress is certainly swift. It's helped by BMW's eight-speed torque converter gearbox, which has all the same deftness as it does in sister CLAR models. Only this time, it's working with an engine that likes to spin amongst its mid-range. The M50d rolls as standard on 22-inch wheels wrapped in Pirelli P Zero rubber of 275 front and 315 rear widths. That gives it plenty of grip to play with, obviously, and also provides the suspension with lots of unsprung mass, which becomes most evident over the rough surfaces of our Lochearn test route in Scotland. The M50d's body control is good here, creating an illusion that it's a smaller, slimmer car, but not even such a well-insulated luxury SUV can mask the thuds of its big wheels as they hammer into the cracks and potholes underneath. As we later find out in the non-M-tweaked models (more on those shortly), the 21-inch wheels provided to them and an overall more forgiving setup eliminates this - but you've no option to soften the M50d with smaller boots. That being said, the big-pawed M50d offers so much more lateral performance. It's typical of the high-powered SUV breed in that it's unstickable on a sun-baked country route. With nothing in the way of steering feel, even when the front axle is loaded up, along with an effective but uncommunicative dose of flat cornering enabled by the air suspension, there's little pleasure to be taken from a B-road. Instead, your focus is drawn to the composure, confidence and an unyielding consistency of pace that defies the scale of the machine. That it still averages something in the high 20mpgs with little effort and can be wound back into conventional DERV duties makes it all the more impressive. We can't think of a more diversely capable oil burner in this segment; the V8 diesel Range Rover, for example, has a considerably smaller interest in being hustled. And Porsche no longer offers its diesel Cayenne. That being said, for most buyers, the X7 30d is arguably the smarter option. Its 457lb ft 3.0-litre six is punchy enough, but the ride on the non-M-fettled air suspension and 21-inch wheels is better. Admittedly, the X7 now feels more cumbersome when pushed hard along a country route, with less vertical body control and reachable grip limits, particularly over the front axle. But the real-world turn of pace is barely impeded. The story is much the same with the petrol 40i, although its inline-six petrol motor - as glorious as it sounds - is rather thirsty. We saw economy numbers in the teens on our country jaunt. 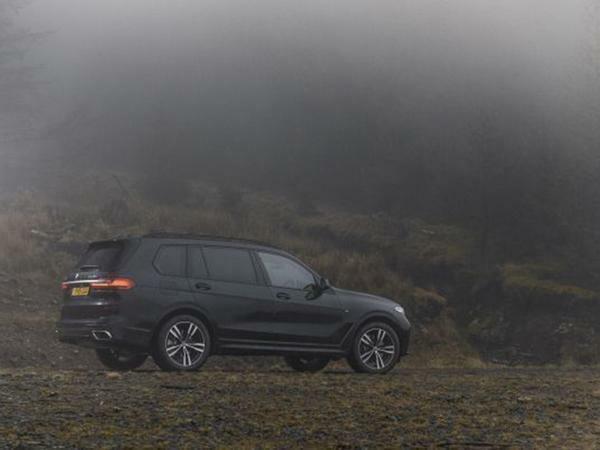 Our Scottish test in the non M-badged models also included some hill climbing in Dunblane, where the all-wheel drive technical armoury illustrated that it was perfectly capable of transporting all 2.5-tonnes of X7 to the peak of a muddy hill - and back down. But not without scraping its extremities over a rock or two, even when the air suspension lifts the body by 40mm. Capable, but not a natural on the rough stuff, then. Let's not beat around the bush, BMW's largest model does exactly what it needs to very well, just without much emotion. 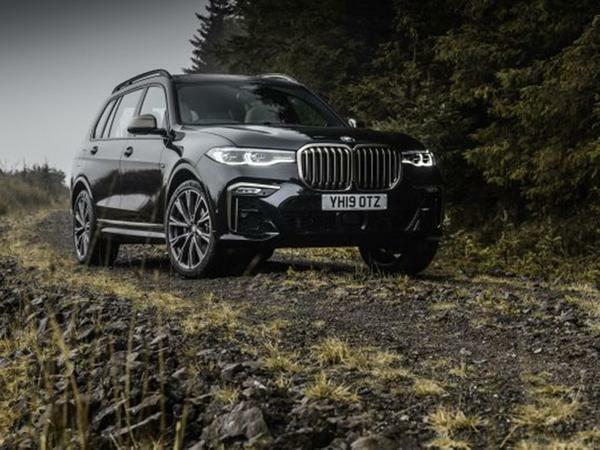 The M50d cannot provide the sort of driving enjoyment one might expect from a high-powered Bavarian SUV, unless you like your cars with the scale-to-pace ratio of a runaway juggernaut, of course. But when it comes to plush, spacious machines in which to shrink journeys with as few fuel stops as possible, the top X7 certainly offers a lot. And if you're behind the wheel, at least you might be able to forget about those kidney grilles. I struggle to see the point over the similar engined X5. This behemoth will be too large for UK car parks, B roads etc. One for the Chinese, Americans and Middle East I’d say. I’m sure it will be possible to navigate most B roads with it. After all delivery drivers in transits get everywhere. Car parks are going to be the big issue surely. Any potential owner will need to have absolutely no intention of ever parking in a public car park/supermarket etc or have a registered disability in order to guarantee door opening space. All this moaning about its looks... It's still better looking than the Bentley and Rolls Royce offerings amongst others. Surly it’s made to eat the motorway miles in maximum comfort not to entertain on a small B road, be perfect for towing a track car around the country so get the luxury comfort on route and then got your track car with you for entertainment! I'm missing something....is this much bigger than the X5? As in they used to do a seven seat X5. I had the last version of the X5 and day to day it was fine on most roads. Going through those width restriction things was a no no and width wise, it wouldn't fit in a standard sized parking bay. My biggest issue was the ride. It just never settled, there was a "jigglyness" to it that I never liked. Plus on those massive tyres in heavy rain, it felt jittery to me. Also if people want a diesel of this size, don't Audi do anything anymore? 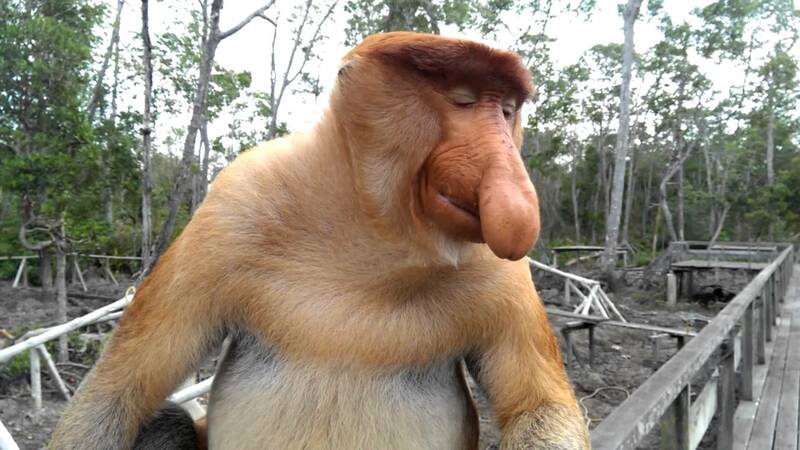 you have to feel sorry for the Proboscis monkey. And on the X7. What's the point? To take sales away from Range Rovers. I’m sure they’ll discount these like crazy so they’ll sell. But Range Rover it isn’t. Not having a blue badge won't stop them parking in a disabled spot! Just because the Bentayga and Cullinan are also hideous, doesn't suddenly make this good looking! Absolutely hideous: will sell by the bucketload. That’s bloody awful. I can’t get over the grilles on the latest X5; they’re comically hue and look ridiculous. Being so tall, they actually make the car look really narrow too. Previous versions were so much better looking. is there an unofficial competition to see who can produce the ugliest SUV? Yep, or a narrow street. Are people really that scared to drive a car a couple of inches bigger? Transit vans are all over the place and don’t seem to have issues. When I worked tramping for weeks at a time in a HGV the only vehicle I had to go to shops/ barbers/ laundrettes etc was my cab and managed fine in that!